Bundanoon – Glow Worm Glen. 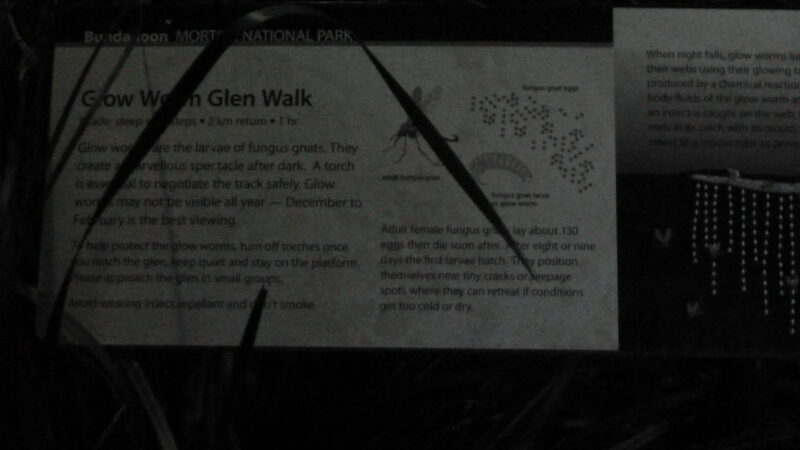 The Glow Worm Glen walk at Bundanoon is really cool. It’s only 2km return. However walking 2km’s in the bush when it’s pitch dark can seem longer then it is. The walk isn’t too hard. But there are some boggy bit’s, so don’t wear your new shoes. There’s a well built platform at the end of the trail and the sound of a water fall. Switch that touch off and check out the glow worms. Directions to Glow Worm Glen. Google Maps Link. The trail head is at the end of Williams St. You can’t park right at the end but close enough. There are a few houses around at the start of the track so respect the neighborhood and try and be quiet. No howlies in the car when you leave. Glow Worm Glen Trail Map. The youtube clip below is of the bushwalk to the glow worm glen at Bundanoon.